Our 30 DAY AB CHALLENGE challenge starts tomorrow in The Hollywood Trainer Club! We are starting this challenge now to encourage you to continue exercising and eating healthy through the Holiday months, a time when people typically gain 10lbs. Grab a friend and join us! You can do it! These workouts range from 10mins to 75mins and they are guaranteed to deliver results! There are 5 workouts per week so you can do all 5 in a row or plan them in your week to fit your schedule! All of the workouts, healthy recipe guidelines and AB BLAST fat burning tips will be posted in the Motivation and News sections in The Hollywood Trainer Club. The best way to achieve your goals is to make a plan and we’ve already done all the planning for you! It’s time to blast the belly fat and reveal those amazing abs! Post a message on the Community Wall in the club www.TheHollywoodTrainerClub.com and let us know that you’re joining us! Click on “Exercise” and then “Virtual Gym” and then “30Day Ab Blast” in the drop down menu and Press Play on Day1! Let’s Go! Beet, Apple, Carrot, Lemon Ginger Smoothie is a Liver Cleanse which is great for your body especially if you have been drinking alcohol. 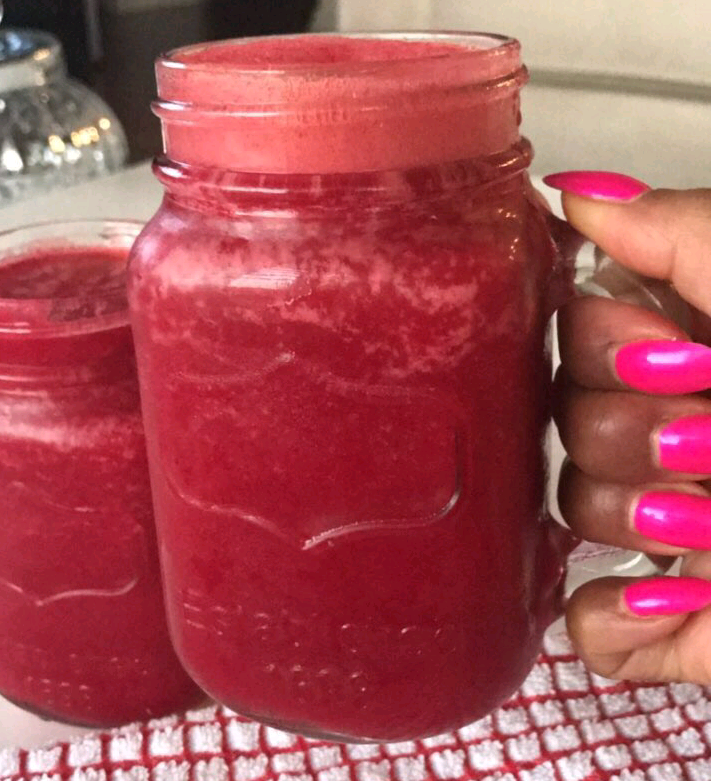 Your liver will love you for the nutrients from this smoothie.”Beet, Apple, Carrot, Lemon Ginger Smoothie” is DELICIOUS! The ultimate Liver Cleanse the powerful antioxidants in beets help detoxify the liver! This smoothie is also incredible for digestion elimination, fighting cancer & a boost of iron for those who are anemic. It’s amazing for the eyes, skin & a great overall energy booster! Strengthens the immune system and helps you feel great! Also a great way to get your kids to eat beets! Try it! All organic: 1 beet, 1 apple, 2 whole carrots, 1 lemon, 1 teaspoon of lemon peel/rind, 1inch piece of ginger, 5 ice cubes & 1 cup of water in any type of blender! Blend it and Enjoy it.